Leadership: Accepting responsibility for enabling others to achieve shared purpose in the face of uncertainty—Marshall Ganz. 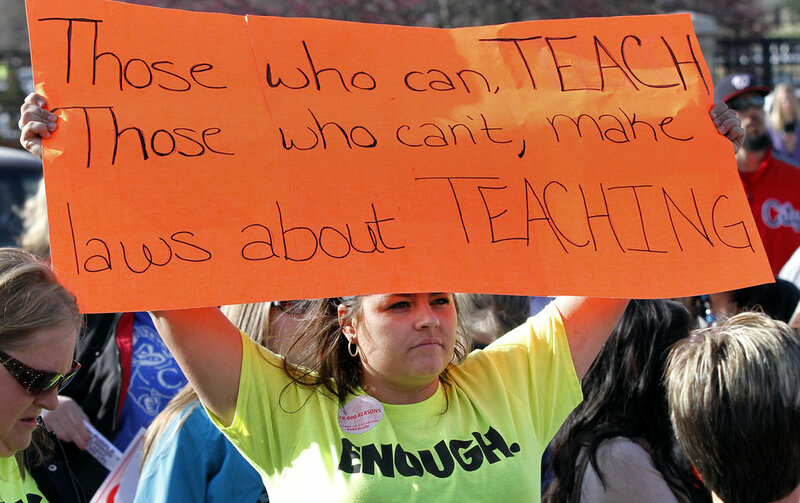 There is very little certainty for public school educators in North Carolina, or across the county, these days. While one is often worse than the other, political leaders from both major parties have spent the last 20+ years following the lead of wealthy donors committed to the dismantling and privatization of public schools. These Social Darwinists, led by the likes of the Koch brothers, Eli Broad, the Walton family, and others have created a sophisticated network of think tanks, foundations, training institutions, policy machines, mass media, and high power lobbyists to advance their cause. When called to account for this destruction, they answer with tricks and feigned concern for low-income students and students of color. The public schools must be held accountable for the achievement gap, they say. But they won’t expand Medicaid to 800,000 families at no cost to the state. And they won’t acknowledge the crisis that 20% of the state’s young people living in poverty represents. And they let ICE terrorize our students and split apart their families. They blame public schools, cut taxes for the wealthy, and keep it moving. Meanwhile, the disparities in wealth, health, and rights grow, and our students continue to suffer. For those of us who have committed our lives to the joy and health and development of thriving young people, it’s been absolutely demoralizing. We’re already doing the hardest job in the world—why are these people making it harder? All of these responses make sense. None of them, however, make change. And none of them reflect the leadership skills and creative/collective problem solving that educators exhibit in our schools in myriad other ways every day. A 4th option, however, is emerging all over the country right now. In response to the uncertainty imposed through the attacks on our schools and communities, our students, their families, and us, massive numbers of public school educators are rising up together and saying loudly—Enough. Basta. West Virginia. Oklahoma. Kentucky. Arizona. 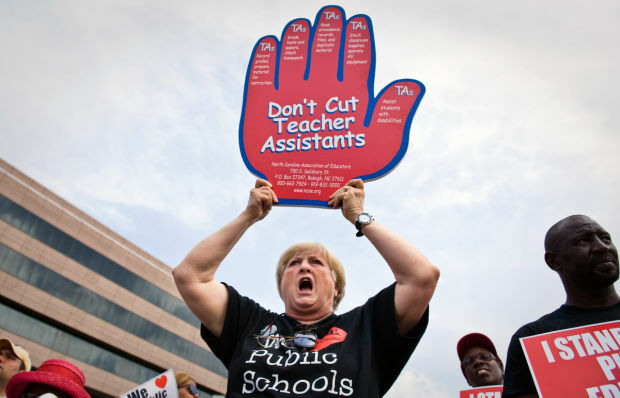 Like North Carolina, all of these states are governed by tax-cutting school privatizers. Also like North Carolina, all of these states have repressive labor laws and relatively weak union infrastructure and activity. 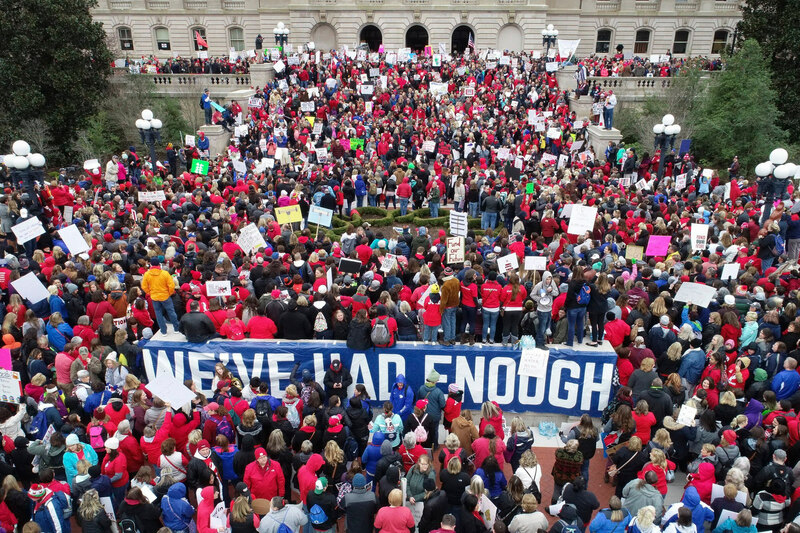 Our co-workers in other parts of the country are leading this round, but Tar Heel educators are getting ready to step into the fray. Those are really the only options. Public schools are the number one employer in nearly every county in the state. We have more power than we realize. If we act together, anyone who answers (2) is in serious trouble. Bull City educators aren’t magical. There’s nothing in the water here. We’re committed to leading and organizing and building the strength of our union, and we know it won’t happen quickly. This week, however, in response to the NCAE’s call for the May 16 Day of Advocacy, DAE leaders got to work in a hurry. In 7 schools (4 Elementary: Club Blvd, E.K. Powe, Eastway, and Southwest; 3 High: Hillside, Jordan, and Riverside), our leaders have either confirmed personal days or commitments to take one from 308 staff members. It took 4 days to get close to, or over, 50% of the staff in 7 buildings. 308 people. We know that many others, in many other buildings, have already made the commitment too. Clearly, educators are fed up. The suffering of our students and their families is personal for us. So is the despair of our co-workers and the well-being of our own families. We’ve had enough. We’re going to Raleigh to fight for our students. We’re going to Raleigh to demand respect. It’s personal. Our state can be a safe and healthy place where all of our young people can thrive, but only if we defeat school privatizing bullies. The futures of our state’s young people are on the line; we have a duty to love them and protect them. We have a duty to lead, especially amidst uncertainty. One thing is for certain: if we don’t demand respect and stand up for our students, things will get worse. Our students, their families, our families, and our co-workers; we’re in this together. There is no purpose more important than the well-being of our community’s young people. Let’s lead. Let’s win. Our students deserve it. So do we. Put in your personal day. Join us in Raleigh.